“What was the first movie?” my 9-year-old niece asked after a recent trip to the multiplex. I hate questions like that. Because I’m a “movie guy,” I feel like I should have an easy reply, but I never do. The first time pictures moved? The first narrative short film? The first feature? There’s not really one answer. So I started talking about Magic Lanterns, galloping horses, workers leaving the factory, THE GREAT TRAIN ROBBERY, the spaceship in the moon’s eye, and Al Jolson. She asked a simple question and she got a Cinema Studies class. But like they say on Facebook, it’s complicated. And it gets even more complicated when you start talking about Talkies. 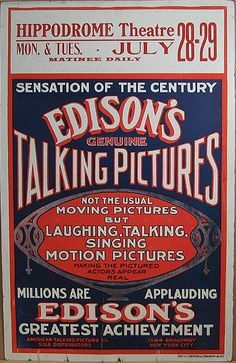 I was reminded of this on Saturday when I attended a screening of newly restored Edison “Kinetophone” sound shorts from 1913-1914 at the Museum of Modern Art. You read that right. Short subjects with sound.